I am a big fan of socks. They are typically a much overlooked part of one's wardrobe. The fancy and colourful hard shells and soft shells often steal all the glory. However without socks on your feet they would freeze in winter and sweat like crazy in summer. Up until a few years ago I was a big believer in cheap synthetic wicking socks that were supposed to move moisture away from my feet and keep them warm and comfy. Not so. For well over 30 years I hadn’t had a truly comfortable skiing experience, be it alpine or backcountry, wearing synthetic socks. Then I tried Merino Wool - the new wonder fabric in my books, and also the main ingredient in all of Point 6’s socks. Merino has a good rep for keeping you warm in winter and cool in summer, and also for not making your feet sweat or stink. Here at Backcountry Skiing Canada HQ, we've reviewed several sock varieties from companies such as Smartwool, Darn Tough, Fox River and Lorpen. All of these products were made with Merino Wool as well as many of the base layer garments we have reviewed. Simply put, Merino Wool is made for active outdoor adventures. 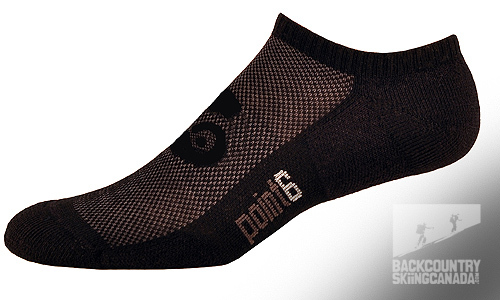 We’ll go into more details in a moment but first, a little background on a sock company called Point6 and why you should know about them. Point6 seems like an odd name for a sock company but when you consider it's origins it kind of makes sense. The body's optimal temperature is 98.6 degrees and the name represents the temperature stabilizing properties inherent to Point 6 Merino Wool. Why not "98.6 Socks" then? Turns out General Electric owns that one and they were not about to give it away cheap. Here are a few things we can tell you about Point 6. All Point 6 socks are made in Steamboat Springs Colorado and not some Chinese sweat shop, so you can wear them with peace of mind. As well, Point 6 is a member of 1% For The Planet, so they give back with every purchase. 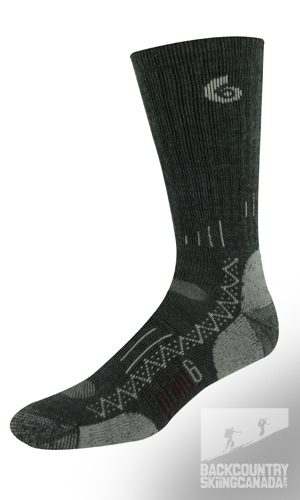 Point 6 was also the first sock brand to use 100% compact-spun Merino Wool yarn. What's this mean? Well it produces a softer and less bulky yarn than traditional ring-spun yarns. Durability also improves 25% (they claim) and since the process uses more wool to produce the yarn it has a smoother surface that's softer next to your skin and not scratchy or itchy. - It's antimicrobial which means it resists odour-causing bacteria. As we sweat we produce microbes that feed on moisture which produce body odour. Merino Wool is made up of 90% keratin which is a very resilient protein that doesn’t support bacteria and therefore won't stink as much. - It absorbs moisture as a vapour but repels it as a liquid since each fibre has a waxy coating of cuticle cells. This natural coating helps repel water in a liquid state but lets it move through in a vapour state. This vapour is then evaporated away from the fabric and your skin. Synthetic fibres on the other hand use a capillary action and must wait for vapour to condense into liquid before it can wick the moisture away from your skin. In the liquid state this moisture doesn't pass through your footwear so you get soggy wet feet after a while. - It's small fibre diameter makes it very soft and comfortable as well as durable, long lasting, and it also resists pilling. Merino fibres are between one-tenth and one-third the thickness of a human hair. This very fine micron makes Merino soft and comfortable with a natural crimp that adds cushion under your feet. - It's highly breathable which helps manage temperature and moisture, keeping you cool when it's hot and hot when it's cool. The crimp of the Merino Wool fibres creates millions of tiny pockets of air which provide a buffering layer of natural heat control that helps your body maintain a stable temperature. When it's hot out these fibres remain cooler than your body and heat is transferred to the fabric. The Point6 Compression Ultra Light Wave Socks use graduated compression for those who train hard, race often and need to reduce recovery time. The ultra light weight of the compression sock offers no cushioning, but instead a form hugging performance fit. Graduated Compression Technology is reported to increases the flow of un-oxygenated blood from the lower legs to alleviate tired muscles, shorten recovery time and improve overall performance while stabilizing muscles. 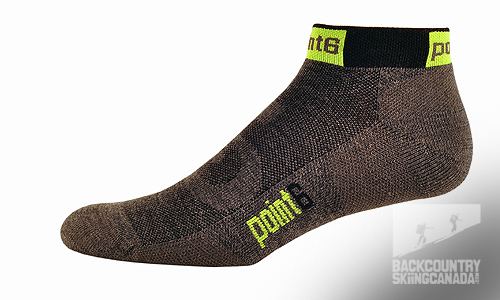 The Point6 Running Ultra Light No Show Socks are just as the name suggests, a very light weight sock that easily fits into low volume shoes but doesn't poke out over the top. All of Point 6's running socks feature a knit-in achilles brace and arch brace for support, ventilation panels for enhance breathability and ultra smooth toe seam to prevent unwanted rubbing against the top, side, and bottom of your toes. Merino Wool manages moisture and temperature next to your skin while the compact spun threads provide a dense, more durable sock that resists pilling and wear. 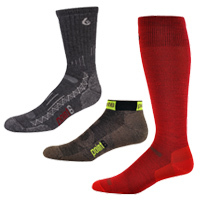 The Point6 Cycling Stealth Extra Light Mini Crew Socks are light weight to reduce heat build-up on long bike trips but offer additional padding underfoot for comfort. A one inch cuff doesn't make these socks invisible under your cycling shoes but does help keep out road debris and dirt that can try and get in. A fabric blend which includes 56% Merino wool provides temperature-stabilizing, odour and blister-fighting properties which are essential on any bike adventure. Other features include a knit-in achilles brace, reinforced sole for durability, a spandex arch brace for support, and ultra smooth toe seam for comfort. The Point6 Hiking Tech Medium Crew Socks use a three-layer construction with merino wool sandwiching a nylon inner framework. This provides a soft and comfortable feel with built in durability. Cushioning across the instep (as well as under it) helps dissipate pressure from hiking boot laces and other pressure points created by heavier footwear. Underfoot the wool cushioning next to the skin insulates and reduces hot spots thanks to Merino Wool's ability to effectively manage moisture. The Point6 Trekking Tech Heavy Cushion Crew Socks provide heavy weight cushioning around the entire foot for protection and comfort on long multi-day backpacking hikes and treks. 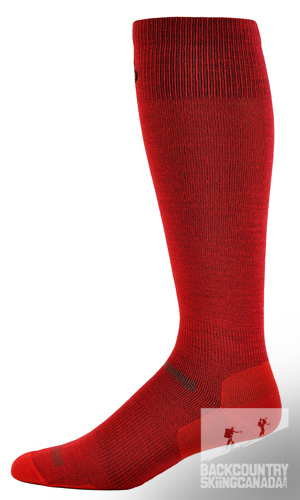 With 80% Merino Wool content these heavy cushion crew socks provide durability and cushioning without making your feet too warm since Merino wool regulates temperature and manages any moisture which may occur. 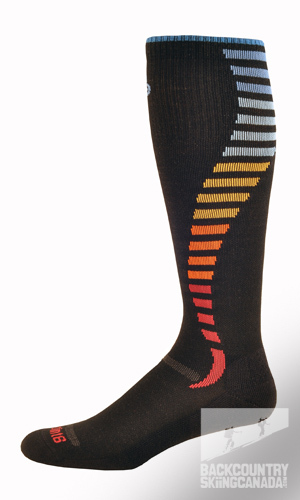 Point6 has over a dozen varieties of ski socks in their current line up. Each one comes up over the calf for added support, warmth and cushioning. 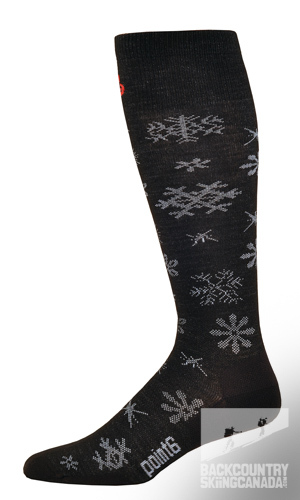 All of the ski socks we reviewed below have at least 61% Merino Wool in the fabric blend. As mentioned above Merino Wool has many benefits and eliminates cold, clammy feet which is more typical of synthetic socks. Point 6 ski socks are available with several levels of cushioning from ultra light through light and medium weights as well as location specific cushioning found in the toes, heels, underfoot, at the shin and around the achilles tendon. These options provide better fit around your foot and a comfortable feel in your ski boot as some boots have less room than others. 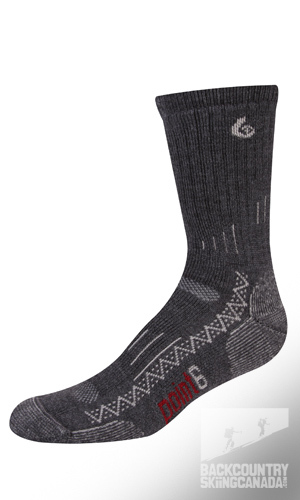 The Point6 Ski Light Cushion Sock is Point 6's best selling ski sock. It serves the middle ground of not too thick and hot and not too thin and cold. Cushioning on the shin and underfoot provides some additional comfort for those that have the room in their ski boots and require more warmth than the ultra light socks listed below. The Point6 Ski Pro Light Cushion Sock is very similar to the Point 6 Ski Light Cushion Sock except that it doesn't have the additional cushioning at the toes and under foot. It does however provide more padding on the shin and surrounding the achilles tendon for a snugger fit with out taking up too much space in your ski boots. 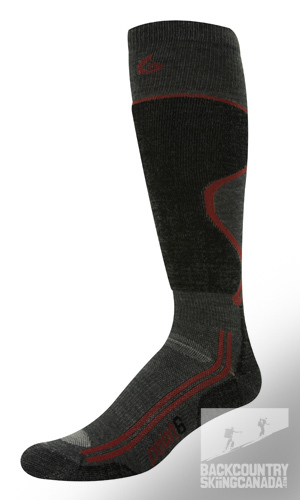 The Point6 Ski Blizzard Ultra Light Sock is as the name suggests - an ultralight sock that has no cushioning. It's ideal for tight fitting ski boots with very little room in the toe box or for those warmer spring days on the skin track when the mercury only dips close to zero degrees and no insulation is required for your feet. 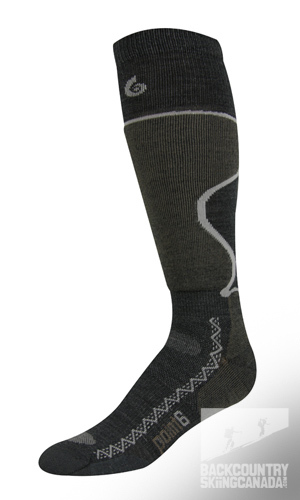 The Point6 Ski ultralight Sock is almost identical to the Point 6 Ski Blizzard Ultra Light Sock. 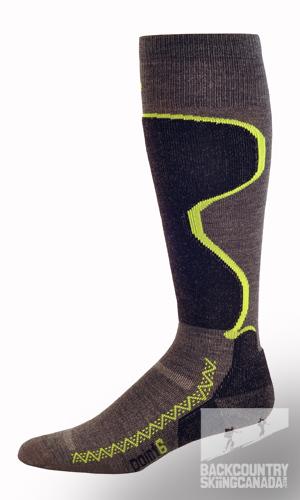 It has no padding but still has all the other great features you will come to love about the other ski, hike and ride socks. This ultralight sock is so thin it's barely noticeable and hence won't provide much insulation value or take up too much space for those who like to crank their ski boots to the max. The Point6 Ski Pro Light Cushion Starburst Sock is one step up from the Point 6 Ski Ultralight Sock and Blizzard Ultra Light Ski Sock. The big difference here is the light cushion (again as the name suggests) which is found in the shin area to help reduce that dreaded "shin-bang". It also incorporates an achilles heel pad to enhance fit in your ski boots. Socks are not a glamorous item to spend heaps of money on but if you can buy a single pair of Point6 merino wool socks I guarantee they will change your view of $20 socks forever. Merino wool ain't cheap, hence the premium cost of Point6 socks but as they say, you get what you pay for. Merino wool changed my skiing experience by leaps and bounds and the 100% compact-spun merino wool yarn in combination with Point6's other fabrics provide an incredibly comfortable, dry, warm and long wearing sock experience. If you compare the price versus the benefits of multiple pairs of discount sweat socks to one pair of Merino Wool Point6 socks you will see that the improved experience easily outweighs the cost. Point6 socks average about 60% Merino Wool content so you know you are getting good value and the combination of other fabrics adds to their durability and comfort based on your desired activity. Rather than spew all the benefits of Point6 Socks and Merino Wool yet again I will just summarize some of my favourite features. I am a big fan of the reinforced heal and toes as they reduce wear over the long term and provide some padding around my digits. The deep heel pocket and the addition of spandex fabric provide a nice snug fit in all socks across the Point6 line and eliminate the dreaded sock creep inside your footwear. The achilles heel pad on the ski line of socks enhances ski boot fit and gives a little extra hug in the heel area to keep things stationary in my ski boots. All Point6 ski socks offer over the shin coverage so you don't have to have a cold gap where sock and base layer are supposed to meet. Instead you get a generous 30cm overlap to keep you warm. The padded shins on the Point6 Ski Pro Light Cushion Sock and the Point6 Ski Pro Light Cushion Starburst Sock were among my favourite as I tend to ride the front seat occasionally while skiing in more aggressive terrain. In the Point6 Hiking/Trekking line the Point6 Trekking Tech Heavy Cushion Crew Socks was my fave. I have plenty of room in my glacier and hiking boots so the added thickness provided by this sock was comfort I need given how stiff and rigid these boots can be. The sock thickness also helped dissipate pressure points from my boot laces and mid soles and provided a comfortable platform to walk on for days on end. And finally the "No show" cycling and running socks are ideal not just for their intended activities but also day to day summer living. This brings me to my last point. You already know I think Merino wool is the only way to go for high performance activities and adventures such as skiing, biking, hiking and running but for this guy they're also my day-to-day socks as well. Give them a shot, it will be the best twenty bucks you have spent in a long, long time.